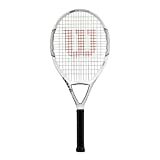 Wilson Ultra 110 Tennis Racket. The Wilson Ultra 110 Tennis Racket features a large oversize head and a big, comfortable sweet spot, which provides high power. Special yoke construction for shock adsorption and added dwell time. Ideal for doubles players looking for light weight, maneuverability, shock absorption, and smooth comfort. Engineered to fit the widest variety of playing styles, the Ultra 110 delivers effortless power, smooth comfort, and versatility from all over the court.